Suntec Singapore Convention and Exhibition Center, a multilevel space that houses a HD video wall, recently underwent a renovation that included a LED lighting solution for the center’s fourth level. For the level 4 renovation, Suntec sought to change the way attendees interacted with the environment and the way they perceive of events and venues. In the downtown modern core of Singapore, space is extremely valuable. “To us, there was one particularly relevant question: How can we design a space with the flexibility to host an exhibition today, a wedding banquet tomorrow and a conference the next day?” explained, Arun Madhok, CEO, Suntec Singapore. 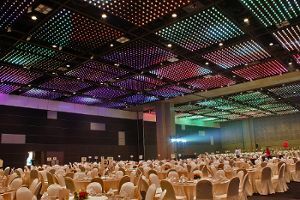 The renovation incorporated the venue’s ceiling into the design to allow for Suntec Singapore to quickly alter an event space or set the mood of an event. The new design is centrally programmed and controlled, eliminating the need for staff to climb the ceiling in order to make adjustments. As a result, Suntec Singapore is now a more flexible, marketable and efficient event space. As part of the innovative ceiling design, Martin’s LED VC-Dot 1’s allows Suntec Singapore to offer its clients flexibility for customers to add logos, messaging and graphics to their event.